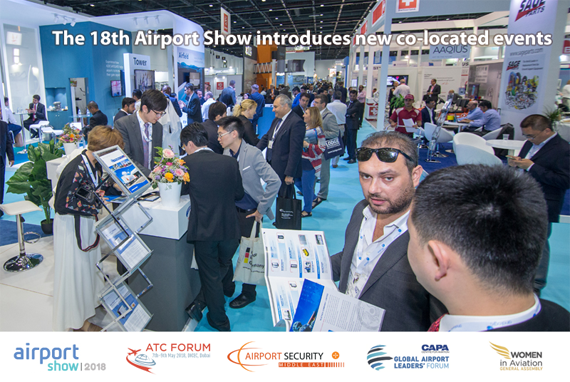 The 18th edition of Airport Show will welcome new co-located events, Air Traffic Control Forum and Airport Security Middle East in addition to its other co-located events CAPA-Centre of Aviation Global Airport Leaders Forum (GALF) and Women in Aviation. The new ATC Forum will offer the air traffic management community a dedicated exhibition and conference aimed at senior level decision makers from ANSPs, CAAs, Airports, Airlines and the Military. Airport Security Middle East will also offer a dedicated conference and exhibition hosting top officials from regional Airport Security departments and facilitating over 1,000 pre-scheduled meetings for Airport Security exhibitors. The world’s largest annual airport event expects to bring together more than 300 exhibitors from over 90 countries under one roof to display their innovative and game-changing products offered to key decision-makers across the Middle East, North Africa and South Asia (MENASA) aviation industry, which is witnessing a massive growth. The show is supported by International Civil Aviation Authority (ICAO), Dubai Civil Aviation Authority (DCAA), Dubai Aviation Engineering Projects (DAEP), Dubai Airports, dnata, Contractors Association and Shipping and Cargo Logistics Group (SCLG). The iconic B2B show will occupy an exhibition take place at International Convention and Exhibition Centre (DICEC), with larger participation expected by country pavilions from Germany, France, UK, Italy, Switzerland, USA and China. Global interest in the Middle East aviation has remained strong given the excellent growth record. According to International Air Transport Association (IATA) global passenger traffic results for 2016 Middle East carriers had the strongest regional annual traffic growth for the fifth year in a row at 11.8% compared with the global average of 6.3%. In Dubai, the planned $32 billion expansion of Al Maktoum International will help accommodate that rapid growth with an ultimate capacity to handle up to 240 million passengers upon completion. According to a new CAPA research, US$255 billion is being invested in new (greenfield) airport projects around the world. Together with the investment at existing airports in projects such as new runways and terminal buildings, runway and terminal extensions and miscellaneous ones (USD845 billion), which means that USD1.1 trillion in airport infrastructure projects are planned or under way within a timescale that continues for four decades into the future. Airport Show is currently taking bookings for final stands remaining. For more information on opportunities and packages, please contact raed.elforkh@reedexpo.ae or mobile: +971 50 653 1941.